European integration has always been associated with the aspiration of upwards economic convergence. However, though accession of fast-growing member states in 2004 and 2007 gave positive convergence a boost, divergences, particularly of the EU’s southern members, have appeared over the past decade. Moreover, there are mounting divergence pressures at a regional level. The conference will examine the process of EU economic convergence in its various forms and consider its driving factors. The idea of a universal basic income (UBI) has gained momentum in recent years. Proponents assert that a UBI will dramatically simplify and improve upon the current welfare state model. While the idea of a UBI is intriguing, real-world implementation is anything but basic. No serious answers have been found to the question of how to finance such a system, and economists are also concerned about the negative effects of a UBI on a person's willingness to work. The topic was recently explored in the current Forum in Intereconomics: Universal Basic Income: The Promise vs The Practicalities. 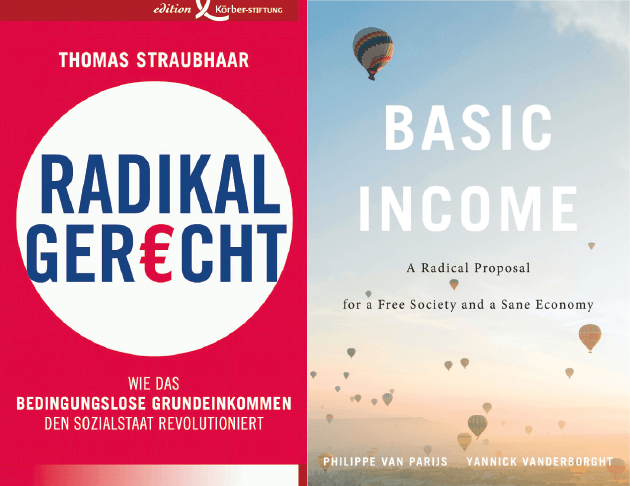 To discuss this important topic further, Wirtschaftsdienst and Intereconomics present two newly published works, by two of the biggest names in the field of universal basic income: Thomas Straubhaar and Philippe Van Parijs. The two authors will present their main arguments, and a discussion will follow on the practicalities of universal basic income, led by Gerhard Bosch. The book presentations and subsequent discussion will be held in English. 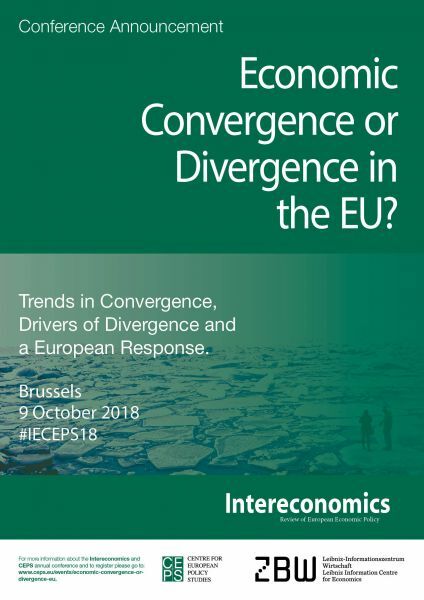 Annual Intereconomics/CEPS conference in Brussels. 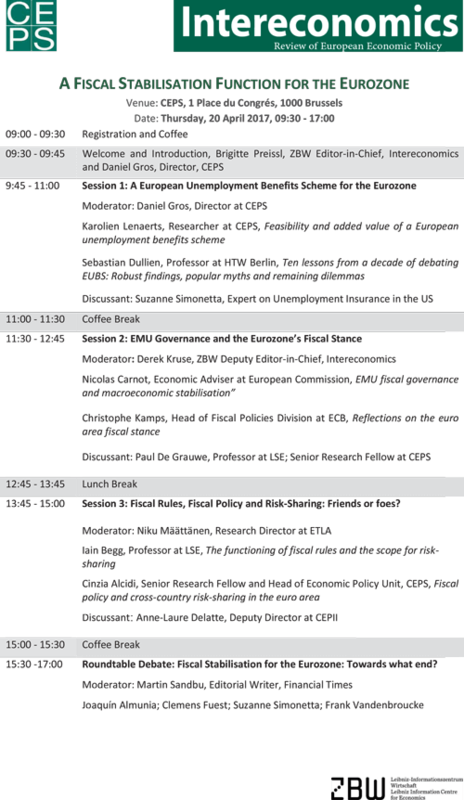 The 7th annual Intereconomics/CEPS conference will explore the benefits that could be gained by granting the eurozone a fiscal stabilisation function, for example through a European unemployment benefits scheme. Top economists such as Clemens Fuest, Iain Begg, Paul De Grauwe and Frank Vandenbroucke will be joined by representatives of the ECB, European Parliament and US Labor Department to debate the implications of such a move. Much attention in research is given to the existence and measurement of gender inequality, but relatively little attention is given to the costs that result from the presence of inequality. At this conference researchers, policy-makers, and business representatives will discuss the costs and inefficiencies that result from gender inequality. What are potential solutions? Which policies? At what level? Join us and put your view forward. Studies and conclusions will then be published in a coming issue of Intereconomics. The joint Intereconomics/Wirtschaftsdienst anniversary conference will seek to identify new sources for economic growth in Europe. What investments can be made now to foster future growth? What is the appropriate role for the state? Have the measures taken to combat the economic crisis opened new opportunities for European growth, or will they merely lead to further stagnation? How can Europe best exploit its economic potential? Following a keynote address by Tito Boeri, the conference will feature three sessions focusing on investments, post-crisis growth and growth potential. Separate sessions will be held simultaneously in English and German. The conference will conclude with a panel discussion (in English) on the future of European growth policies, which will be followed by an evening reception. On the occasion of the anniversaries of the journals Wirtschaftsdienst and Interconomics, the Senate of the Free and Hanseatic City of Hamburg hosted a reception in the City Hall on 10 May 2016. Many of the journals' long-term companions, former chief-editors, advisory board members, authors and other guests celebrated with the editorial team in this special event. TTIP: Political and Economic Rationale and Implications? The Transatlantic Trade and Investment Partnership will reduce tariffs and lower regulatory hurdles that currently impair trade between the EU and the US. However, TTIP has been controversial from the outset. Non-governmental organisations are concerned about lowered health and environmental standards, unions fear a further weakening of labour conditions, and economists debate whether or not there will actually be any noticeable impact on employment and GDP growth. Contributions by the speakers at the 2015 Intereconomics conference were published in an Intereconomics Forum about TTIP presenting a balanced overview of both the prospective benefits as well as the possible drawbacks to the potentially monumental trade agreement, in Intereconomics Volume 50, November/December 2015, Number 6. 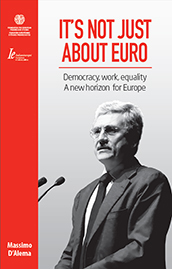 On 12 January 2015, 6 p.m. Massimo D’Alema will present his book "It's Not Just About Euro" at the Leibniz Information Centre for Economics (ZBW) in Hamburg. His new book proposes a different Europe. It develops a concrete proposal for Europe to finally move beyond austerity to a more democratic and inclusive Union, able to recover its role on the international stage. This is a passionate exhortation for progressives to address the crucial decisions that lie ahead. The continued economic crisis has become a major test for the labour markets of individual member states. Labour mobility within the European Union has the potential to help to reduce labour market pressures and ease economic imbalances. However, a long-term loss of working age population can be detrimental to sending countries. This conference explores mobility patterns within the European Union and analyses the labour market and welfare effects of labour mobility via case studies of the UK, Poland, Germany and Spain. It also examines a number of its aspects that have important political and institutional relevance for the European Union and its future. Contributions by the speakers at the 2014 Intereconomics conference were published in an Intereconomics Forum discussing labour mobility in the EU, in Intereconomics Volume 49, May/June 2014, Number 3. As economic inequality in Europe has continued to rise, it has become the subject of increasing academic attention. What are the drivers of inequality? How does it affect intergenerational economic and social mobility? At what point does inequality become a drag on economic growth or a threat to social order? What economic policy tools are available to reduce inequality? This conference addresses these and other aspects of this complex and disturbing trend. Case studies of Ireland, Germany and Spain also highlight the impact of economic inequality on individual member states. 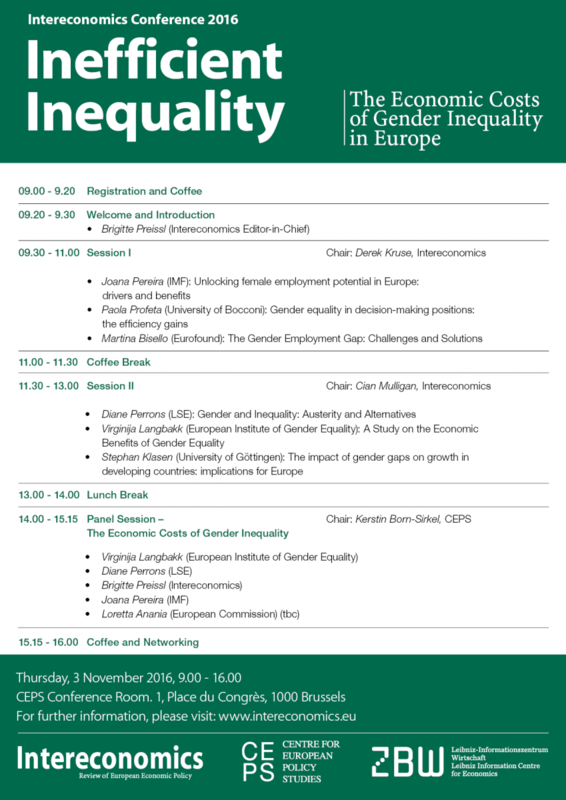 Contributions by the speakers at the 2013 Intereconomics conference were published in an Intereconomics Forum discussing the topic of inequality in the EU, in Intereconomics Volume 48, November/December 2013, Number 6. Contributions by the speakers at the 2012 Intereconomics conference were published in an Intereconomics Forum discussing the challenges to and opportunities for the welfare state after the crisis, in Intereconomics Volume 47, July/August 2012, Number 4.